What’s geekier than a blog? A mo-blog. That’s a road trip blog, a mobile blog. And since I can blog from my Blackberry 8830 with photos, I figured I might start one when I pick up my 2009 Mini Cooper S. I can also upload photos to the laptop and then blog using the broadband card if I don’t want the crappy Blackberry photos. 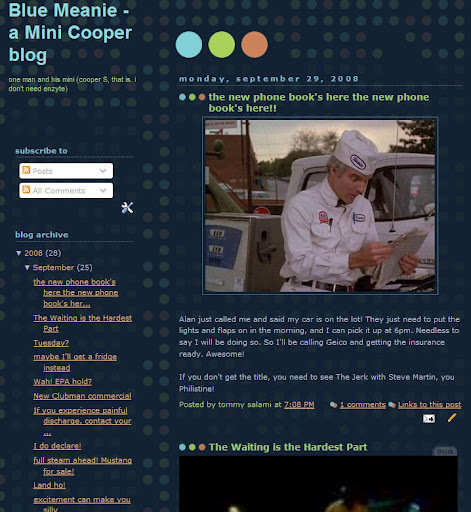 My mo-blog is over at bluemeeny.blogspot.com and will probably take over or duplicate some of the Greasy Spoons posts if I make road trips to them. Same deal for some of the brewery visits. I’m picking up the car tonight, but I don’t think NJ will let me get a PLUCKU2 license plate. We shall see.